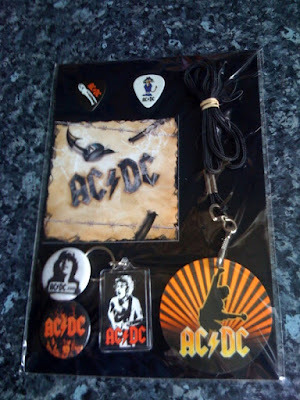 I wasn't looking forward very much to receiving this Fan Club Pack from the AC/DC Fan Club, but this one is even worse than I expected. HAHAAHAH. I'm sure than not even a 12 year old super-stalking-fanatic would be impressed with this pack. It consists of 2 pin-buttons, one cheap key-ring, two plectrums and a lanyard of some sort along with a card. I've not opened it as I don't see any point in it. Maybe it'll be valuable 10,000 years from now and I'll be able to cash in. Not very rock n' roll this! Either way the Fan Club membership has paid off in the sense that I've got tickets to both Birmingham and Wembley this year, and at a discount. YAY!